Canuck Wealth System was reported by 4 of our Canadian readers as a scam, with each of them losing at least $250 with the software. So if you are considering to sign up for it, make sure you read our full Canuck Wealth System review before paying for it. In this review, we uncover the various tricks and hidden secrets by Canuck Wealth System scam, and how you can identify online scams in the future. The alleged owner of Canuck Wealth System, Jake Mason from Canada boasts his software as a fully-automated binary trading system that can generate huge profits for you. The selling point of the software lies in its ability to trade on your behalf, enabling you to generate profits even without any trading experience. What’s more, it comes for free as Jake said that he is not going to charge you a single cent for using it. To make it even more compelling, we can see several fanatical “members” of the system who allegedly made huge profits, and giving all the credits to Canuck Wealth System in the beginning of the sales video. The lady in the screenshot above is one of the few members who claimed to have benefited greatly from the software. However, under all these seemingly wonderful promises, Jake Mason and Canuck Wealth System has some sinister lies hidden from you. Canuck Wealth System scam uses actors and actresses to record fake testimonials as if they are real. The same lady that appeared in Canuck Wealth System video was also featured in another scam we have reviewed earlier, called The Millionaires Maker. In both videos, she claimed that she made a ton of profits using the respective software, and that it changed her financial life forever. However, she is actually a Fiverr actress who makes money by reading the scripts of her clients, and record it into a video like it’s a piece of real testimonial. You will be able to find her profile in the Fiverr page, along with many other actors and actresses who provide similar services for as low as $5. We do not condone or condemn the act of selling and buying fake testimonials, but you should be aware of this – that fake testimonials can easily be bought online. Don’t trust these testimonials too easily, or you may suffer financial losses. 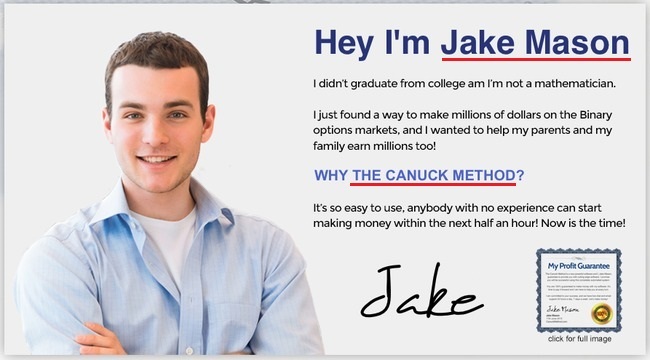 Jake Mason is said to be the alleged creator of Canuck Wealth System, or “The Canuck Method” (refer to screenshot above). A lot of people don’t realize this, but it is actually a sister site for another scam we have reviewed before – The Aussie Method binary software scam. 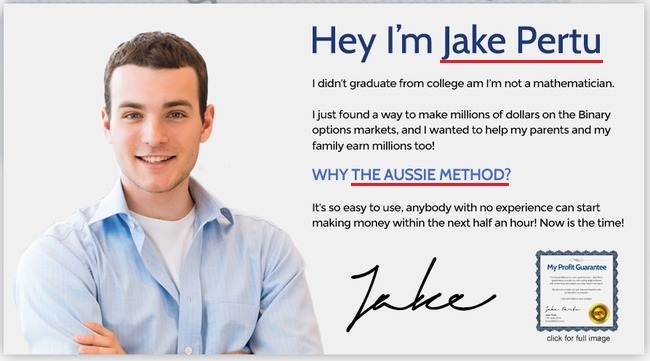 In The Aussie Method site, the name of the founder is changed to “Jake Pertu” instead of “Jake Mason”. However, everything else was kept the same, including the pictures and wording of the marketing material. In fact, “Canuck Wealth System” was originally called “The Canuck Method”. When more and more reviews revealed The Canuck Method, the scammers recycled it into the Canuck Wealth System that we see today, in order to prevent its potential victims from finding out from existing reviews. This is why the screenshot above shows the system as “The Canuck Method”. The Canuck Wealth System is an automated binary trading software, which means it can trade binary options automatically on your behalf. For those who are inexperienced in binary options, it is basically trading stripped down to its simplest form. You don’t have to read financial charts or follow financial news to trade. With binary options, you only predict if the price of an asset will be higher or lower after a fixed period of time, usually between 30 seconds to minutes. There can only be 2 outcomes – either you are right, or you are wrong. Let’s say I bet $50 on the price of gold market will go higher on a 1-minute options contract. When the time is up, and the price is indeed higher, I win a certain percentage of what I bet, usually between 60% to 80%. But if I’m wrong, I lose the entire $50 that I bet. This makes binary options very similar to traditional gambling. To make things worse, market movement in such a short period of time is completely random and unpredictable. It’s just like trying to guess the outcome of a coin toss. The probability of winning or losing is close to 50-50, but even if you achieve a 50% win rate, you’ll still lose money due to the uneven winning vs losing payout. Will you risk $50 for a chance to win $40 in a gamble of coin toss? Of course not. In fact, binary options is so risky that even Forbes warned us against gambling with it. Even though Canuck Wealth System claims to help you make profit using its advanced software algorithm, unfortunately there’s no future-telling software. If the software can really achieve consistent profits for its users, why do they need to hire Fiverr actors and actresses for fake testimonials? Their only goal is to coerce you into depositing money for your trading account – in which you’ll quickly lose to the scammers through a series of losing trades. In the FAQ section, we were promised that the software will place winning trades for us, fully automated. Canuck Wealth System went one step further by promising more profits for those who deposit higher starting capital into their trading account. However, as much as they want to hide the truth, they have to reveal the true nature of the scam somewhere within the website to avoid legal actions. They chose to hide it at the very bottom of the page, via a fine print that reads “disclaimer”. Unfortunately, the vast majority of their victims won’t even realize it’s there. You can authenticate our screenshot against the original disclaimer at their site via this link: cannuckwealthsystem.com/terms. Despite promising you guaranteed profits, Canuck Wealth System is denying their guarantees. As long as you set foot on cannuckwealthsystem.com, you are considered aware of and accept these terms, even if you haven’t read the disclaimer at all. Keep in mind that these terms and conditions are not here to give you a fair warning as a consumer. The sole purpose of this document is to protect the scammers from legal actions when you lose all your money trading with Canuck Wealth System software. You can’t take any legal actions even if you lose all your money, because you have accepted the terms as soon as you visit their website. Is Canuck Wealth System a Scam? YES, CANUCK WEALTH SYSTEM IS A SCAM. We strongly advise you to stay away from the scam if you don’t want to lose your hard-earned money.